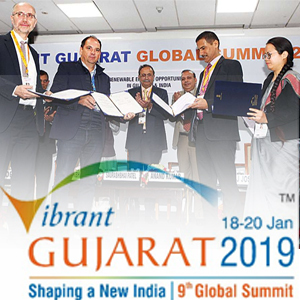 MoUs proposing investment of more than Rs 1 lakh crore were signed in the renewable energy space on the final day of the Vibrant Gujarat Summit (VGS) on Sunday. The Memorandums of Understanding would create more than 10,000 jobs upon completion, which is expected by 2020 and 2021, said officials. The Solar Energy Corporation of India (SECI) signed MoU with Gujarat Power Company for setting up a 1,000 MW offshore wind power project at Pipavav with an investment of Rs 15,000 crore. The Dholera SIR Development Authority signed MoU with Gujarat Power Company for a 1,000 MW solar power project at an estimated investment of Rs 5,000 crore, and another for a 4,000 MW plant with SECI. The MoU would involve approximate investment of Rs 20,000 crore. Tulsi Tanti-led Suzlon Energy proposed investment of Rs 25,000 crore for developing renewable energy hybrid projects in Kutch and Saurashtra. Adani Green Energy proposed Rs30,000 crore investment for similar projects in Kutch, said officials. Torrent Power signed MoU to invest Rs 5,325 crore for creating wind power generation capacity of 750 MW, in Kutch. It also proposed investment of Rs 3,150 crore in power distribution network in Ahmedabad, Gandhinagar, and Surat. The company said it will also invest Rs1,000 crore for power distribution network in Dholera. These projects were a part of the Rs 10,000 crore investment commitment made by Torrent group chairman Sudhir Mehta at the inaugural session of Vibrant Gujarat Summit, said a senior official. The state government's power transmission arm GETCO signed MoU to invest Rs2,190 crore for setting up transmission network and sub-stations in the state.